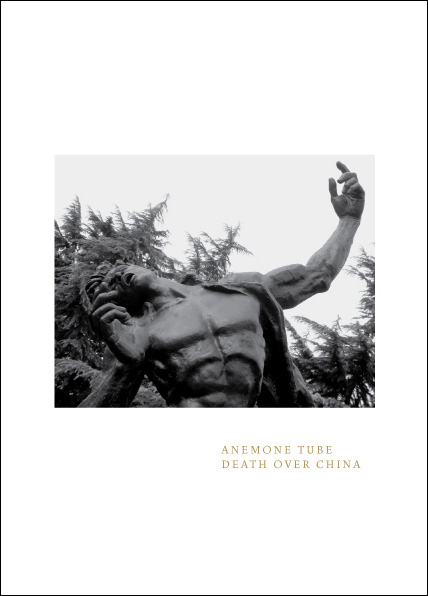 Although a 2011 release ‘Death Over China’ is the latest from Anemone Tube and an album I had read a number of very positive reviews about before checking this out myself. This also constitutes the second release in a trilogy which commenced with the ‘Dream Landscape’ album from 2010. Conceptually the album is focused on China and from an analysis of the track titles and various cover photos (included within the beautifully designed DVD sized ten panel cardboard fold out cover), it appears to be making conceptual commentary on the negative cultural and environmental impacts of rampant industrial development and progress experienced in China over recent decades. At its most simplistic level the sound of ‘Death over China’ is very much one rooted in a sphere of dark ambient and heavy industrial, which edges towards power electronics territories during a couple of segments. However such a statement effectively ignores the means of how this album was constructed and composed. Interestingly the album’s liner notes states that all music was solely created by field recordings made by the artist during a trip to China in 2007 (specifically Nanjing and Shanghai), with additional synthesiser elements added to only two of the six album compositions. This sort of dedicated concept for the construction of the music makes the overall sound and atmosphere of this album all the more remarkable. Of the six varied album tracks they each take a multi-layered approach to composition, where recognisable field recording elements (car horns, passing traffic, police whistles, loudspeaker/ radio announcements and general urban chatter etc.) are looped in combination with other less recognisable distortion and static driven sounds to achieve vague soundtrack like movements. Likewise with new looped elements being continually introduced, the atmosphere is one that morphs and builds in tone and intensity as the tracks progress. With the sound source predominantly consisting of field recordings it engenders the album with a varied and interesting tonal quality, which is rich and unique when compared to dark ambient and industrial material that is reliant on synthesised and computer generated sounds. Effectively Anemone Tube achieves a sound that spans the divide between ‘academic’ experimental material and ‘underground’ industrial territory. Likewise within this context Anemone Tube have achieved a particularly unique sound, which these days can be a challenge to say the least within ambient/ industrial spheres. With is central reliance on field recordings ‘Death Over China’ avoids the pitfalls of the field recordings which can come across as unnecessarily abstract or academic. Anemone Tube has also successfully realised the concept of utilising field recordings as a instrument and in the process has executed an album which is intricate and tonally varied, yet highly listenable. With its complexities and nuances this warrants and demands multiple rotations and detailed attention. This entry was posted in 2011, dark ambient, heavy electronics, industrial, power electronics, Silken Tofu, Topheth Prophet by noisereceptor. Bookmark the permalink.